HSB will match any authorized dealers price! If you find a lower price (including shipping, handling and delivery) on an identical item with the same features currently available for sale and delivery from an authorized dealer, contact us with the competitor's details in writing and we will match that total price. Please call us 1-866-306-0249 or e-mail customerservice@homeshopbuy.com and be prepared to provide our team with all the required information, including shipping, handling and delivery date. HSB reserves the right to require that a quote of a lower price from an authorized dealer be sent to us in writing. We appreciate your business and we will never sell, share, or distribute any of our your information to any third parties. Your information will only be used to process and ship your order and to occasionally inform you of special offers and rebates. If you would prefer not hear from us regarding our exclusive savings program simply e-mail us at customerservice@homeshopbuy.com to be removed from our list. Home Shop Buy is a manufacturer authorized dealer. All of our products are covered by the manufacturer's warranty. 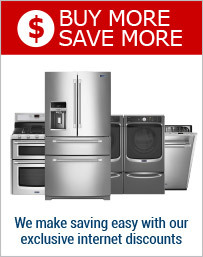 We also offer extended warranty plans on most of the appliances that we sell. The warranty details of the specific model that you purchased are contained in that item's product description. If you have any questions regarding warranties or you are buying multiple products and would like multiple warranties, please contact a representative at 1-866-306-0249 or email us at customerservice@homeshopbuy.com. We offer a wide variety of manufacturer and Home Shop Buy exclusive product rebates. To see a list of the current rebates and promotions please visit our Home Shop Buy Rebate Center. You can download the current rebate forms from the rebates page and print them. You can submit the form for processing after your products have been delivered.